I have never had a sensible answer to the inevitable question that has plagued me for the last three years: what exactly do you do with a PhD in coffee? Since my maternity leave runs out frighteningly soon, and a few short months after that, the thesis should be submitted, I thought I’d better try and find an answer. I tried to somehow develop a career in academia, applied for 5 lectureships, only two of which I was actually interested in doing, and didn’t even get shortlisted for any of them, such is the hopelessness of the academic jobs market at the moment. One job had 92 applicants. This threw me into an agony of indecision though because, as I hadn’t taken seriously the possibility that I would get the Mercanta job, we had begun to work on an even more exciting, daunting, exhilerating, stressful, creative and expensive project, that is, AFTERNOON TEASE! Afternoon Tease is our new café. I have been on about opening my own place since time immemorial and at the moment, with the safety and comfort of the PhD drawing to an end, Miranda to worry about and the need to find some sort of employment in Darlington (laughs bitterly), I decided that now is the time I should take the plunge and actually do it. Ideas that are never acted on are a waste of brainspace, and I do believe that if I wait “for the right time” I’ll never do it. There’s never a *right* time. The idea was simple enough – I want a cafe, but I do not have anything like the resources to do it by myself. My Wonderful Friend Jo wants a sort of “office” space to devote herself to her writing and music and set herself up as a freelance writer and performer. My Wonderful Friend Tattoo-Jo (it is very difficult going in to business with two partners both called Joanne) is a Burlesque artist and teaches Burlesque classes locally, and could really do with some rehearsal space. So, what happens if we share the rent on a unit and combine the lot? A burlesque cafe and writers workshop, sort of thing. And the name became obvious after our first serious discussion. The other plan is to create a baby corner; Miranda is going to have to come to work with Mummy everyday (which I still reckon is a far better option than putting her in childcare at 5 months old) so we have all sorts of things, including a knitted tea pot, for the people too small for caffeine to play with. Actually getting it set up has taken an enormous amount of time – far longer than I had naively hoped. We found one unit which would have done, but the landlord was more than a little unhelpful and it all fell through. We looked at more, and nothing was suitable for what we wanted or could afford. Then my driving instructor pointed out that a unit on Parkgate was free. Even after finding it, we then had the epic tasks of getting hold of the estate agent and then getting hold of the solicitors and then getting them to actually do what we want them to, and then scraping together, begging and borrowing to get the deposit together, then waiting and waiting and waiting and waiting to get the lease… aaaaaaaaaargh. Just as we were about to settle the lease, I got a call from Mercanta and did the phone interview. So I had an INCREDIBLY tense ten days where the lease could have appeared at any point, and I was simultaneously awaiting the outcome of the Mercanta interview to see whether I’d go to London. I honestly couldn’t decide, and both Jo’s were incredibly supportive and understanding, especially since one option basically meant screwing them over in the middle of all our hard work. But, on Saturday, I FINALLY got the lease. (with spelling mistakes in it?! £350 for solicitors fees and two weeks late, wtf?). And then next time I checked my email, I also got an email rejecting me from the Mercanta job. Which I can’t help feeling was mainly because I don’t live in London, and possibly because I have Miranda. This pissed me off. However, Afternoon Tease was obviously meant to be! The next two weeks are going to be insanely busy turning the unit – which used to be a model railway shop – into a cafe, including building the kitchen from scratch and making the toilets inhabitable by normal people. The espresso machine has got to be pulled from my beloved Ape van and replumbed into the kitchen, but *of course* everything shall be ready by our opening do! We’re having a big party for our opening night on 4th December, and open to the public on 6th December. Do come visit us! I found coffee!! Or rather, a lovely lady called Veronica found me coffee. Carl went to school with Veronica about twenty years ago, and through the wondrous medium that is Facebook, they were able to get back in touch. Veronica is now married and has a son called Joshua and an adopted daughter called Thembi. They live about an hour away from Karen and co in Hazyview, so we toddled off up there to introduce Miranda. I get the impression Carl quite likes showing off his beautiful little daughter! Veronica had got in touch previously about Sabie Valley Coffee Farm – obviously one look at my Facebook page told her that I am a coffee geek. So far I have been starved of good coffee since I’ve been here! I had a few at a chain coffee shop called Mug and Bean, which were fairly decent (though on quantity not necessarily quality, I got a “bottomless” cup and drank three while I had the chance!). Karen is convinced it is bad for you and won’t drink it, but that could be because she only buys “Frisco” – instant soluable “coffee” with chicory in it. I have braved it on occasion this week just because I am feeling caffeine deficient, but I really wish I hadn’t. Yuk. Vile creation. So, I was really surprised to hear about Sabie Valley, I had no idea South Africa produced any coffee at all! Turns out, they produce a whopping 50 tons a year, if they are lucky. The owner, Tim, didn’t say if his was the only coffee farm in the country, but did say that many had given up farming the stuff during the early 90s price crash. Sabie Valley only survived by starting to roast the coffee and open the farm as a tourist attraction. Tim told the same story that I’ve heard all over the world: that there is no money in growing coffee, all the profit is in roasting and import/export. 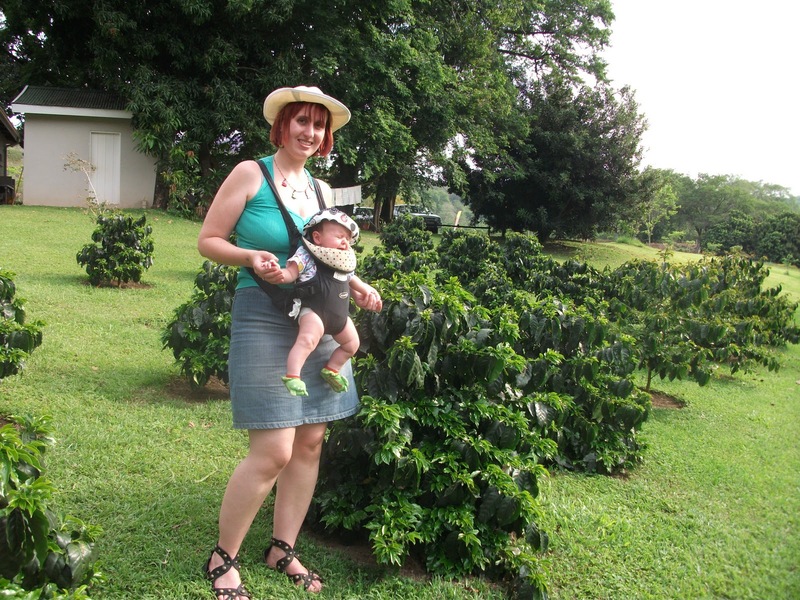 The 8 hectares of Sabie coffee are all arabica, and harvesting here takes place between March and May, so of course we missed it, but I did get to show Miranda some baby coffee trees and she tried the strangely sweet fruit. I did try and explain my waste project, and found that, interestingly, they do not use the fruit as fertilizer, as they’ve found it just attracts too many pests. In all the excitement, I forgot to ask what happened to the water used for washing the coffee. 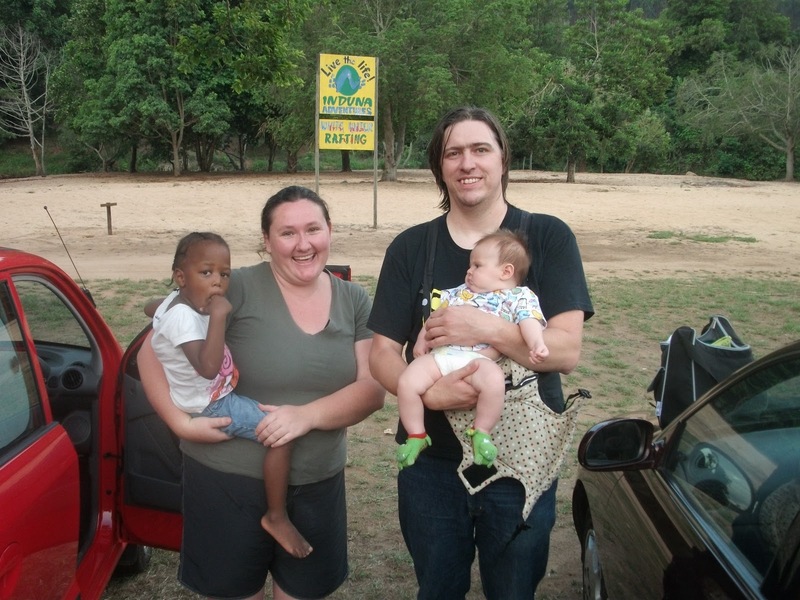 The Sabie river runs through the bottom of the farm, and Veronica had packed us a picnic to have by the river bank. 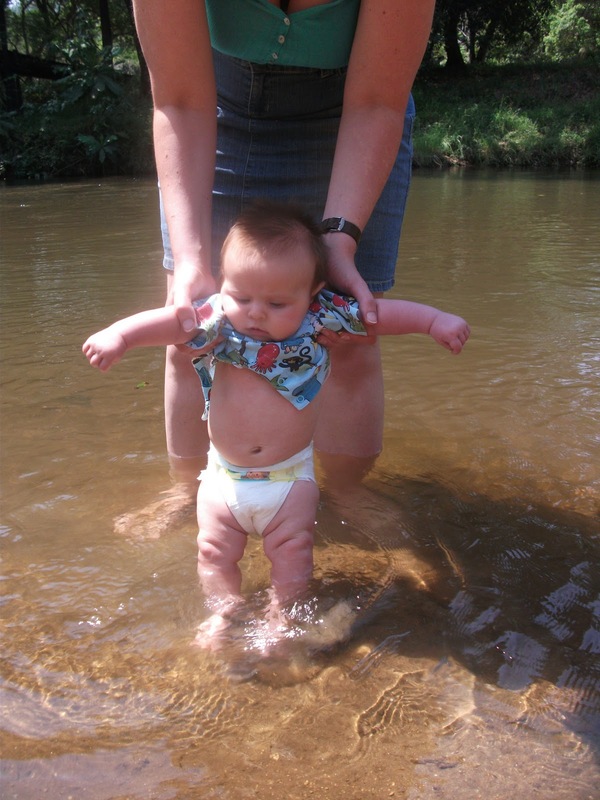 We had all gone swimming in the river too, and Miranda taught us a new word: “gur-yarhur”, meaning “It’s cooooold!” Poor baby! The water was clean and clear, and I couldn’t see any obvious signs of coffee farm run-off, but Veronica warned us not to swallow the water for fear of ‘belhalzier’ disease. I neither know what that is nor how you spell it but it does not sound fun! We had gone swimming because it was stinkingly hot, over 30 degrees. Although the roasting room smelled amazing, it proved too hot for poor Miri and Veronica took her outside to play with Thembi. Tim does his own “bushveld” roast, somewhere between medium and dark roast. Of course I had to try it all, and it was good, very earthy and nutty like most of the African coffees I’ve tried. Carl’s favourite. I think I preferred the dark roast though, it had more flavour. I was talking so much as ever, that I never got round to trying the espresso. Doh. Nevertheless, we washed it down with huge slabs of chocolate cake, which Miranda enjoyed a great deal. I came away having met a new friend in Veronica, another coffee-geek, 4 bags of beans, slight sunburn, and a very sleepy daughterling. A brilliant day. We even saw a barn owl when we got back to Karen’s too! Tis over a year old now, but very interesting article arguing what I argue – that Fairtrade and quality are not necessarily the same thing, and that paying premiums for high quality is more beneficial in the long run than guaranteeing a minimum price.